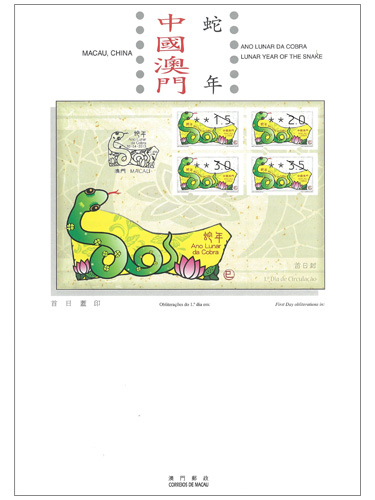 Macao Post issued the label stamps with the themes of “The Post Closer to You”, “Modern Works and Buildings”, “Environmental Protection” and “World Heritage” in 1993, 1999, 2002 and 2008, respectively. 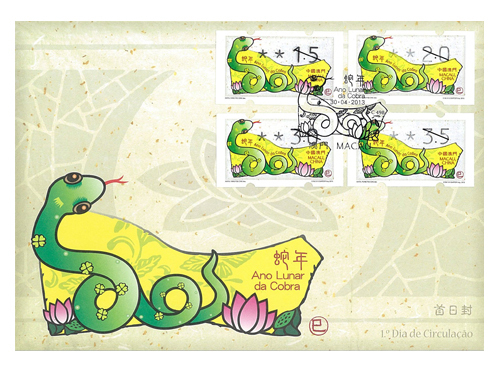 The first issue of Chinese Zodiac with the theme of “Lunar Year of the Snake” will be issued on 30th April, 2013, the printing quantity is 750,000 label stamps. 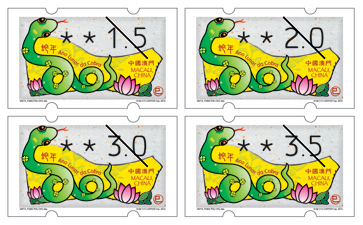 On the issue date, the maximum sales-quota per queuing customer is 10 sets of label stamps, 5 first day covers with label stamps and 10 information brochures with label stamps. Besides, the automatic stamp vending machines located at the Central Post Office will have a temporary arrangement; the maximum time limit for using the vending machine is 10 minutes for each queuing customer. This is the sixth issue in 2013. 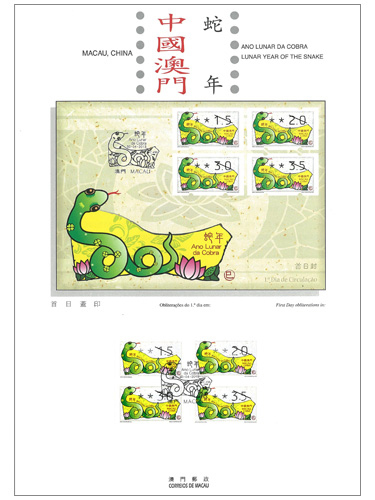 The previous issued stamps are “Lunar Year of the Snake” on 03/01/2013, “Centenary of the Macao Chamber of Commerce” on 23/01/2013, “Mainland Scenery V” on 01/03/2013 and “20th Anniversary of the Promulgation of the Basic Law of Macao” on 31/03/2013. The stamp “130th Anniversary of the Establishment of the Fire Brigade” to be issued on 25/04/2013.